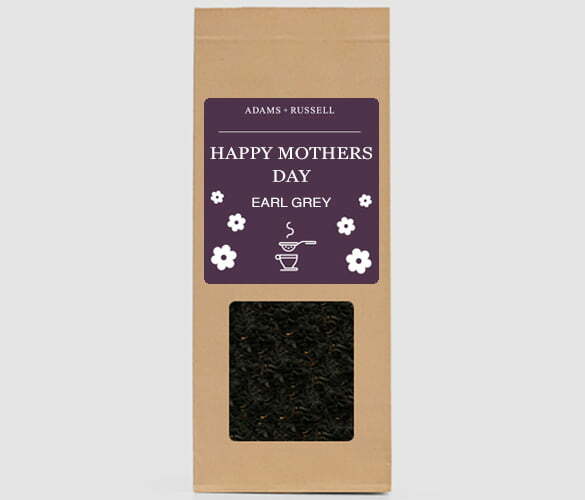 Our special Earl Grey Tea is the perfect present for your Mother this year. We have used the highest quality loose leaf Earl Grey tea to create a truly unique gift. To make it extra special, we have also designed a one of a kind Mother’s Day label, featuring a decorative font and flowers. Earl Grey is traditionally made from black tea leaves, although some companies have experimented with green or oolong as the base. The oil of a Bergamot orange, which is a similar size to an orange but is closer in colour to a lime, is added to the leaves to give a fragrant flavour. This oil creates the unique flavour we all recognise and gives the tea a floral aroma. Calming effect – The Bergamot oil has a calming effect and will help boost your mood, due to its natural aromatherapy characteristics. Immune boosting – This oil can also help boost your immune system. Healthy teeth – It contains Fluoride which helps protect your teeth cavities and decay. Weight loss – The citrus extract can contribute to weight loss. Energy boost – It has a small amount of caffeine which gives you the perfect boost. Healthy digestion – It helps your digestion run a lot smoother and relieves painful indigestion. There are many ways to make Earl Grey, and brewing with loose leaf is much easier than you might think. The freshness of loose leaf is unbeatable, and we’re sure you’ll never look back when you make the switch. Rinse the pot out with hot water to remove any dust or dirt and to preheat it. Remove the lid and scoop the loose leaf into the basket (use a guide of one scoop per mug). Boil the kettle and pour the hot water into the filter basket. Leave to steep for around 2 – 3 minutes with the lid on. Once brewed, remove the lid and the filter basket (be careful, it might be hot). Pour into cups, relax and enjoy. What should I put in my Earl Grey Tea? If you’re Mum is a true tea lover, take a look at our Mother’s Day gift set for an extra special surprise.